Mt. Horeb Dental provides dentures and complete dental care for Mount Horeb, Wisconsin and the surrounding areas. 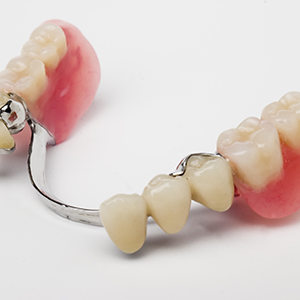 Dentures are removable replacements for missing teeth typically made out of an acrylic resin which at times incorporate porcelain or metal for additional structural support. There are two main types of dentures. Both Complete Dentures and Partial Dentures are finely crafted and custom fitted. If you properly maintain your dentures they will appear natural and provide an adequate replacement. Additionally, dentures help strengthen muscles controlling your expressions that require the support of your teeth, rid you of pronunciation problems caused by missing teeth and aid with chewing. The procedure begins with a wax bite impression of your mouth that will give your dentist exacting measurements. A try-in appointment will fine tune color, shape, and custom-fit. After your final dentures are fabricated and inserted, you will be informed of their required care.